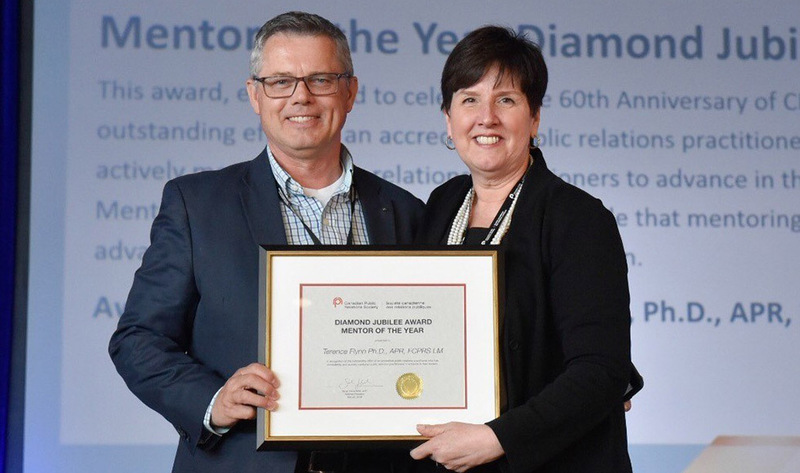 The Canadian Public Relations Society (CPRS) announced Terry Flynn, associate professor in Humanities, as their 2018 Mentor of the Year during the CPRS Connexions 2018 national conference. “I’m honoured by this award. As a 30-year plus member of CPRS, I have always felt a duty to give back and help to share with others the lessons I have learned over my career,” said Flynn. Flynn was praised by his three nominators for being the embodiment of what it means to be a mentor, as well as for being an approachable and available ‘cheerleader’ to those moving up in the profession. He was further described as being ‘composed, informed, strategic and kind’ and applauded for making new practitioners feel welcome, included and respected. Flynn has an extensive history of being of service to his fellow practitioners, including acting as the Society’s 55th National president. He was previously awarded the 2015 Philip A. Novikoff Memorial Award for his countless, significant contributions to the Canadian public relations profession. He was presented with this year’s award in front of a roomful of colleagues and mentees at Charlottetown’s Delta Prince Edward Hotel. The <a href="http://cprs.ca/" target="_blank" rel="nofollow noopener">Canadian Public Relations Society</a> (CPRS) announced <span class="xn-person">Terry Flynn, associate professor in Humanities,</span> as their 2018 Mentor of the Year during the CPRS <a href="https://www.newswire.ca/news-releases/the-canadian-public-relations-societys-biggest-event-en-route-to-canadas-smallest-province-680717711.html" target="_blank" rel="nofollow noopener">Connexions 2018</a> national conference. "I'm honoured by this award. As a 30-year plus member of CPRS, I have always felt a duty to give back and help to share with others the lessons I have learned over my career," said Flynn. "From my days as a consultant to my current role as a university professor, I have felt that one of the most important things that membership and involvement in CPRS does is allow all of us to connect with one another; to help us advance as professionals and as a result, help the profession advance in its contribution to society. I want to thank my wonderful nominators from CPRS Northern Lights and the national board for bestowing this award on me — it is truly a humbling experience." Flynn was praised by his three nominators for being the embodiment of what it means to be a mentor, as well as for being an approachable and available 'cheerleader' to those moving up in the profession. He was further described as being 'composed, informed, strategic and kind' and applauded for making new practitioners feel welcome, included and respected. Flynn has an extensive history of being of service to his fellow practitioners, including acting as the Society's 55<sup>th</sup> National president. He was previously awarded the 2015 Philip A. Novikoff Memorial Award for his countless, significant contributions to the Canadian public relations profession. He was presented with this year's award in front of a roomful of colleagues and mentees at <span class="xn-location">Charlottetown's</span> Delta Prince Edward Hotel. Read more on <a href="https://www.newswire.ca/news-releases/terrence-terry-flynn-phd-apr-fcprs-named-canadian-public-relations-societys-mentor-of-the-year-683963681.html">newswire.ca</a>.